In 2008, I became a published author of my first book, Day by Day, The Chronicles of a Hard of Hearing Reporter, published by Gallaudet University Press. It is an honor for me to have them publish my book since I was not born deaf, but probably born hard of hearing, and became deaf by age 50. Thompson’s hearing loss was first detected when she was around 10 years old. For the last decade she has reported and written a column for the Suburban News Publications (she is based in Ohio). Combining reprinted columns with brand new narration, she tells the story of the years before and after her hearing declined (she later became completely deaf). She takes a lead-by-example approach by humorously advising hard of hearing readers on the importance of resilience in functioning in family, work, and artistic life through means such as hearing aids, FM systems, and guide dogs. Her life story includes a diagnosis with Multiple Sclerosis, an interest and emerging career in writing poetry, and a recent cochlear implantation that restored 95% of her hearing. Elizabeth Thompson writes and lives in Grove City, OH. “The short of it – I became deaf. The long of it – I learned how to cope.” The first words of Day by Day are a tidy summation of author Elizabeth “Liz” Thompson’s lifelong struggle with hearing loss. But Thompson lives for the details, and it is through the details in her memoir – a compilation of essays, poems and personal refl ections – that the reader gets to know this remarkable writer. Thompson’s hearing progressively worsened from childhood into adulthood until, by her thirties, she was profoundly deaf. In Day by Day, Thompson recounts her struggles in the workplace, starting time and time again in entry-level positions because of her hearing loss; raising her daughter as a single mother; and in a delightful chapter, a humorous first fateful meeting with her now husband, Bob. 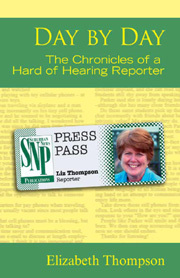 In 1998, Thompson landed her first job as a reporter for Suburban News Publications (SNP) – a position which, as a hard of hearing person, came with its own set of challenges. Soon she began writing a regular column for SNP also called “Day by Day,” many of which are revisited in her book. We see the student reporter discovering her gift as a teacher, gently sharing with hearing readers how to interact with people who are deaf, such as in the column entitled “Some Difficult Questions Should Never Be Asked.” She spotlights her beloved hearing dog, Snert, with a primer to the hearing on how hearing dogs should be treated. She also encourages those with hearing loss to seek help, with a reminder that they are not alone. ISBN 9781563683701, Gallaudet University Press 2008, 204 pp., $25.95. Dear Liz- I love your book! On Friday I was coming back from visiting my mother in Dayton and stopped at the library to pick up “holds” for my daughter. After I checked out and was walking out the door, your book caught my eye. I read an announcement about your book and I have read many of your columns in the SUBURBAN NEWS. So I went back in to check it out. I finished your book on Saturday. It was a joy to read. I love your peace of mind and your ability to change with the years, your positive attitude, your ability to laugh at yourself…..just love it all. I am so glad that your life seems to have come full circle. I love your descriptions of hearing things for the first time. My Mother is 82 years old and lost her eyesight to a genetic retinal disorder about 10 years ago. As a daughter, I was surprised and disappointed that my mother has not been able to move on. Our trip to her house on Friday was to discuss the idea of counseling. I know that she has had a devastating loss (as was yours) and I am sorry that she cannot move out of her depression. We have tried to help her but really do not know how. So, reading your stories was a breath of fresh air. I hope that if I get this horrible disorder that I can prepare as you did and be able to keep a positive outlook. Your book made me think about getting a recorder for my Mom and having her record her life story. She cannot read or write at this time but she can talk and hear. So recording her story might work for her. I hope she likes the idea. I loved your comment “Excuses make me weak”. I think I can use that with my high-schooler and middle-schooler. Thank you for the inspiration and your lovely book. I know that your life has not been “all roses”. But, it seems you have remembered those rosy times and have held on to them. I enjoyed your domain, thanks from honduras! ~blog Lover Hello, this is great article. I have blog and I thanks to say you thanks. Regards! I’m impressed, I must say. Very rarely do I come across a blog that’s both informative and entertaining, and let me tell you, you’ve hit the nail on the head. Your opinion is important; the issue is something that not enough people are talking intelligently about. I am really happy that I stumbled across this in my search for something relating to it.